This article has been re-posted with permission from The Nifty Stitcher. Here is a great cathedral window pattern that will let you brush up on your hand sewing skills. 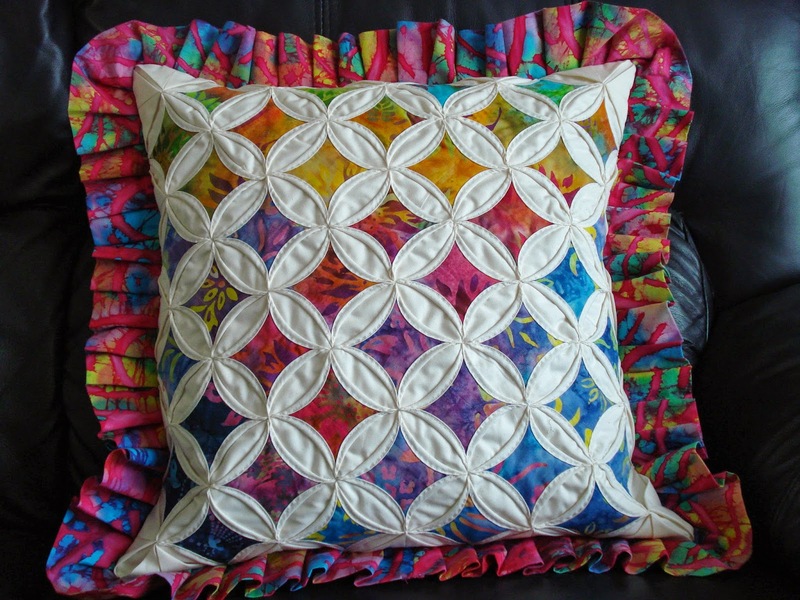 Use these techniques to make a fabulous ruffled pillow with the colors and fabrics of your choice! Step 1: We will start by working on our individual squares. Make sure you have cut out 25 8” squares of fabric. 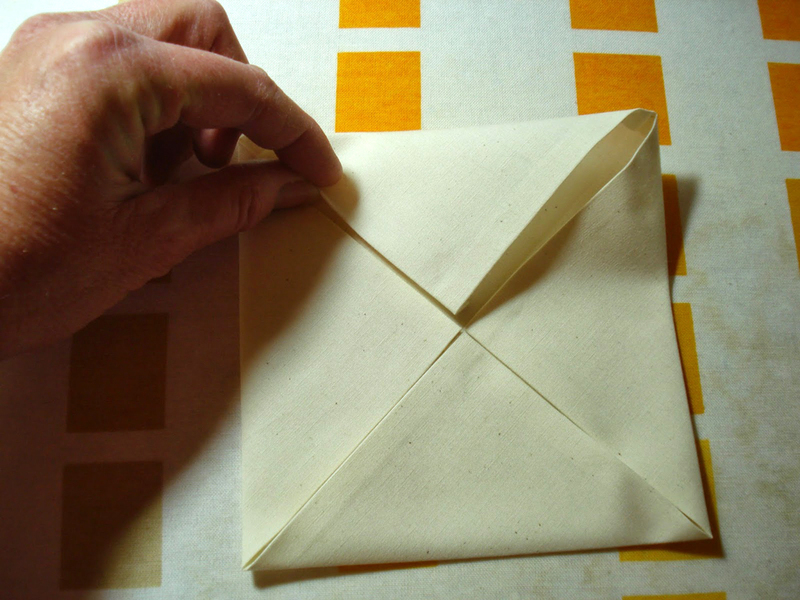 Then, take one square and fold over 1/4″ on all sides and press. 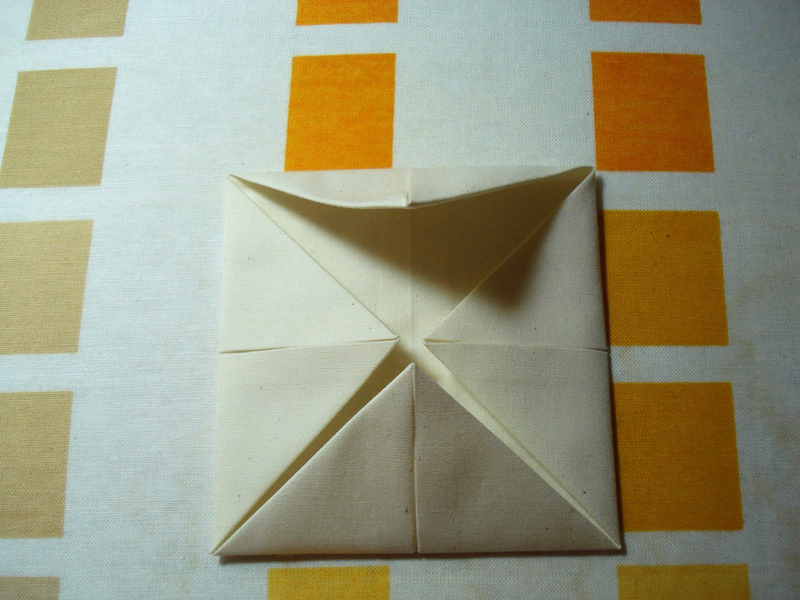 Step 2: Fold in half and press, then fold the opposite way and press. You want crease lines here. 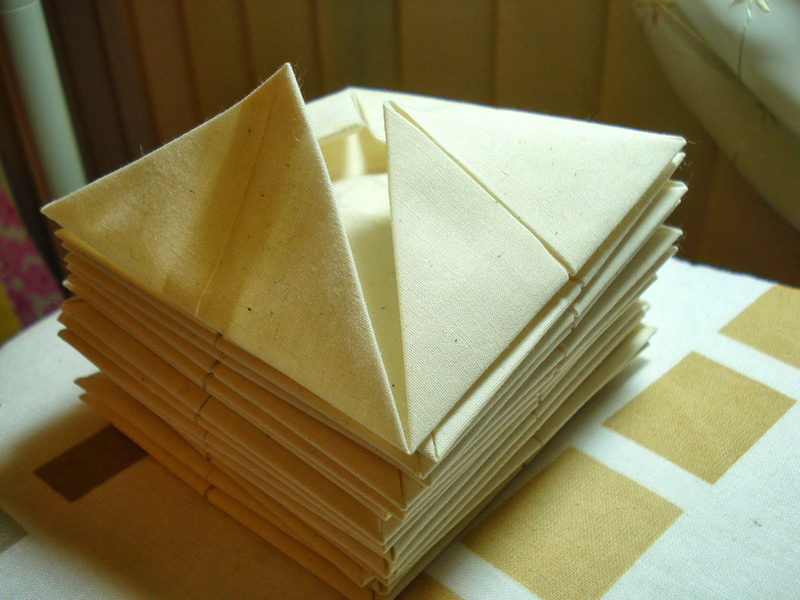 Step 3: Fold each corner into the center and press. Aim for nice sharp points on each corner! 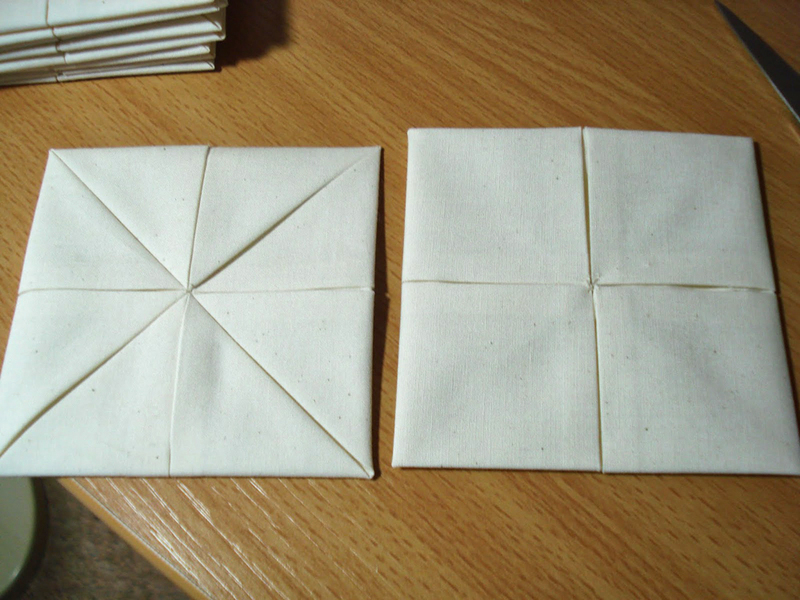 Step 4: Next, flip the square over and fold each corner into the center again. 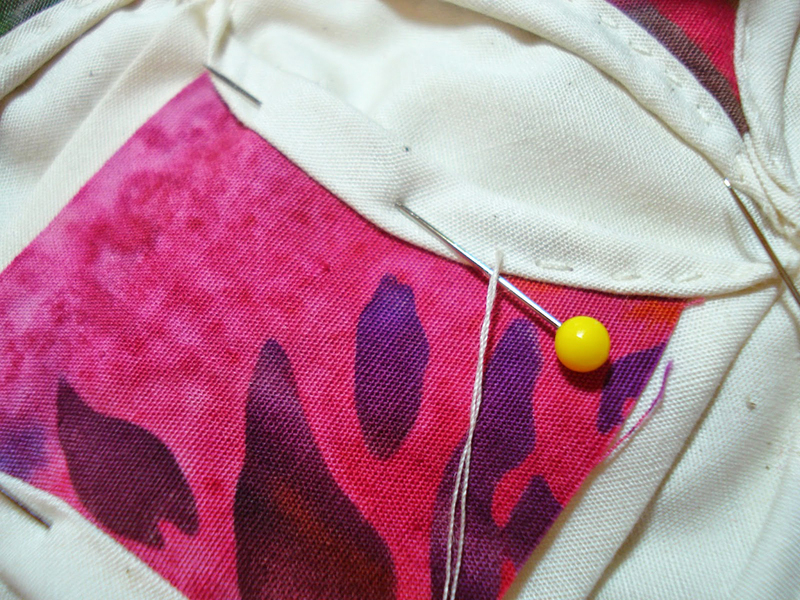 Step 6: Using your thread doubled, secure the points of each square with some small stitches. 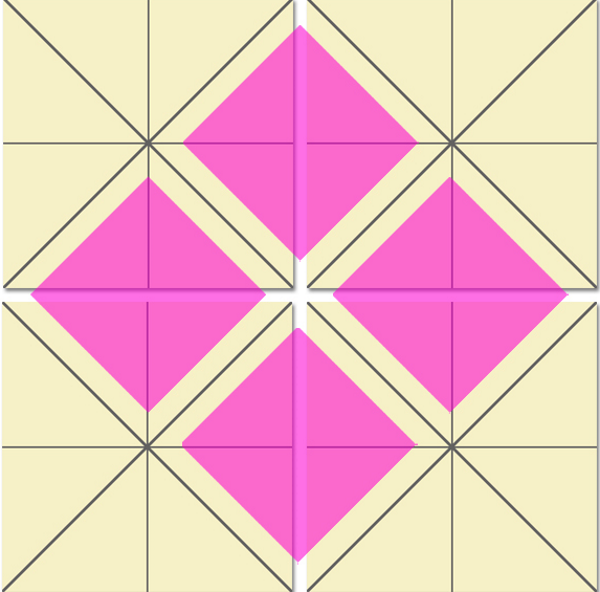 Step 7: This is what your squares should look like now. The square on the left is the front and the square and on the right is the back. Step 8: Now take 2 squares with right sides together and sew together. Double your thread for extra strength. Don’t worry too much about your stitching here as this won’t be seen. Step 9: Then sew all your squares together in this way to give you the face of your pillow. Step 10: Now it’s time to add the windows! 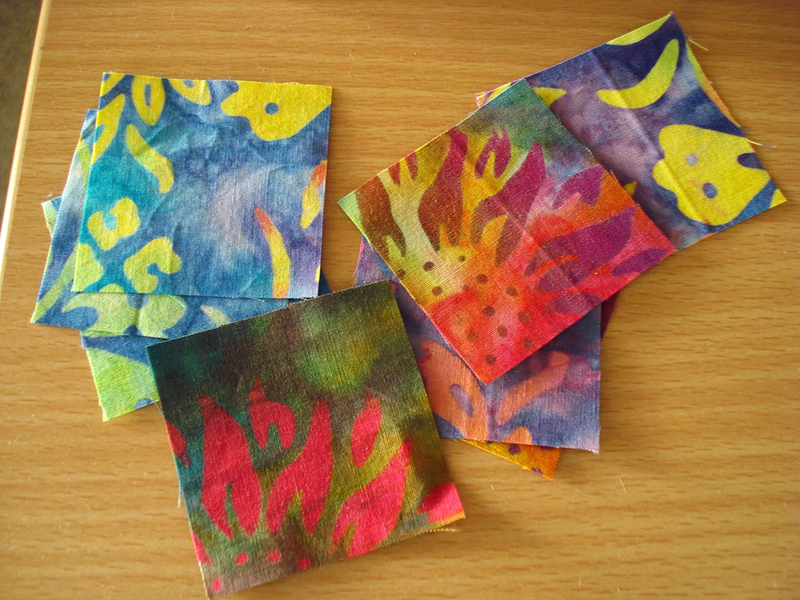 You will need a selection of 2″ squares. 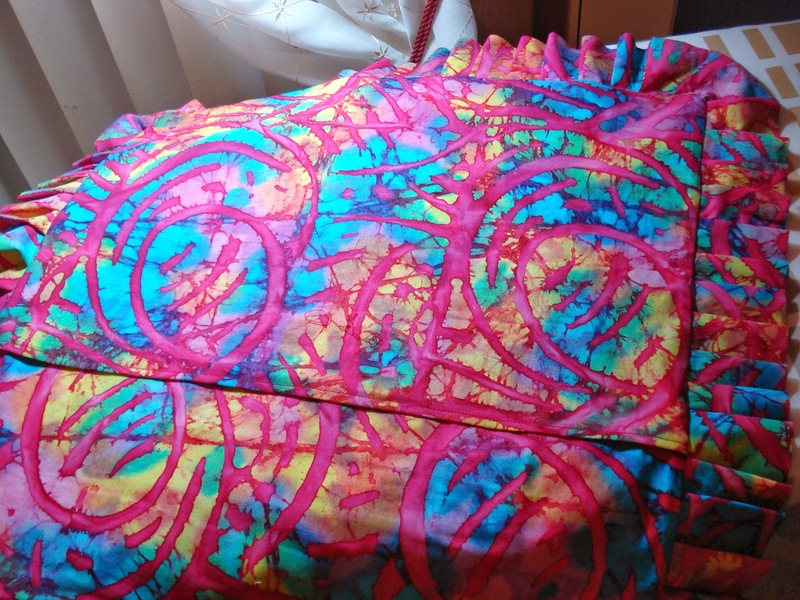 I’ve used some colorful batiks for my pillow. 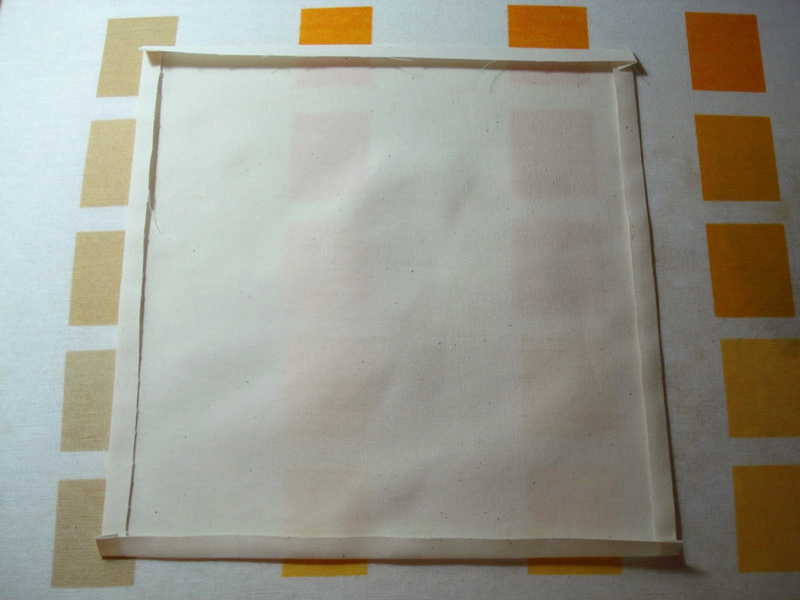 Step 12: To “frame” the window, you will take an edge of your folded fabric that is underneath your 2″ square (represented by the green line in the diagram) and carefully fold/roll it over the edge of one of your 2″ squares to get a nice curve. Pin in place. Step 13: Then you will work a running stitch along your curved edge. Try to do this very neatly, especially if you are using a contrasting thread! Step 14: Keep this going until you have filled all the boxes. Isn’t it beautiful? Step 15: Now we’ll move on to the frill. You will need double the length of each side. First cut 5″ strips, join them together, fold over, and press. (Hint: it’s just like making binding.) If you want a smaller ruffle, simply cut your strips narrower. 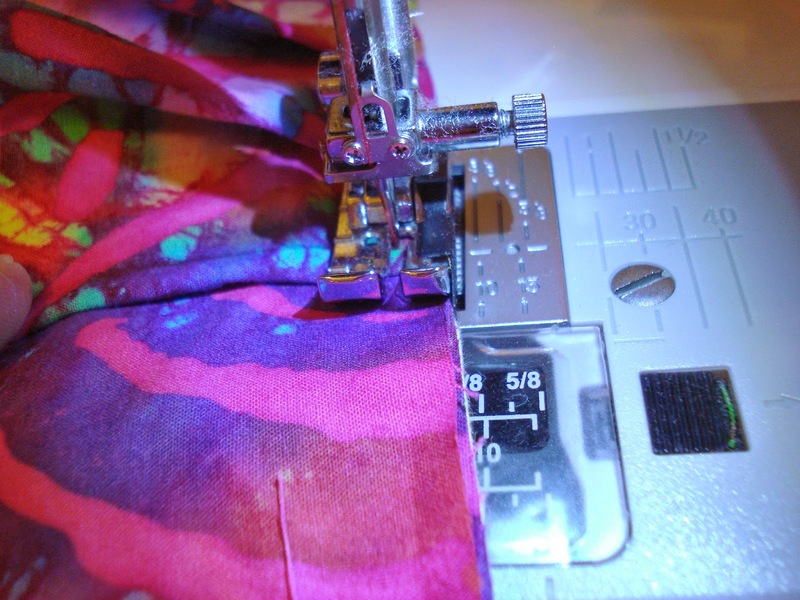 Step 16: Pause with the needle in the down position (if your machine has that function, otherwise do it manually) of the previous pleat, and make the next pleat. Continue all the way around. 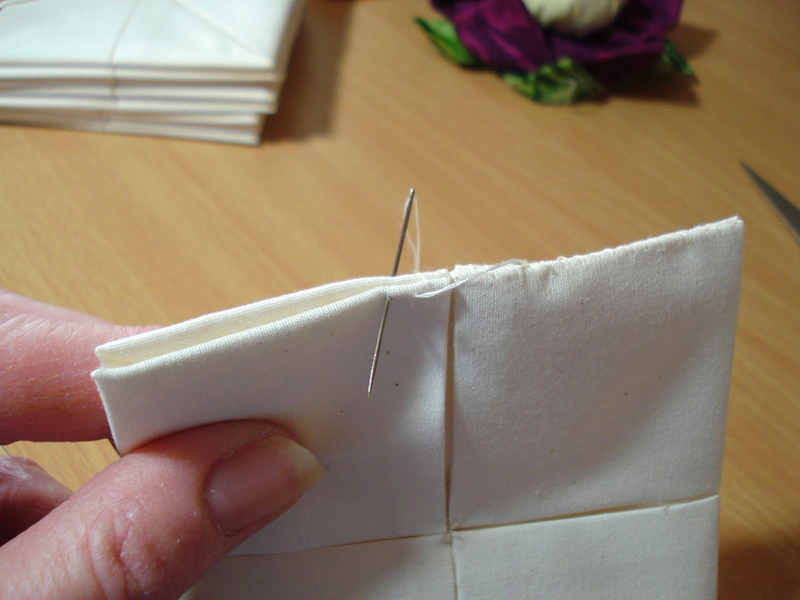 At the corners, make a pleat as close to the corner as you can, turn the corner, and immediately make another pleat. Step 17: Before the backing is added, pin the ruffle at the corner neatly so as not to catch it when stitching down the backing. 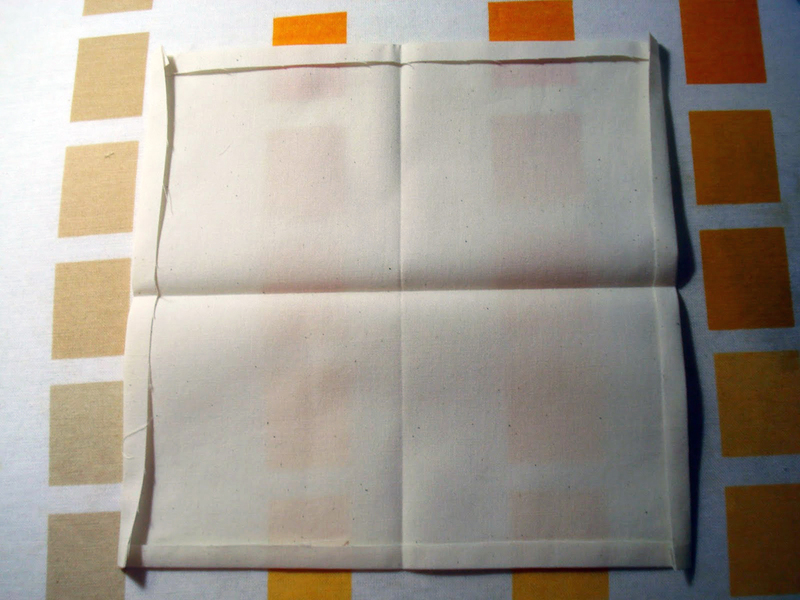 Step 18: For the backing cut two rectangles the width of the pillow and about 12″ long. 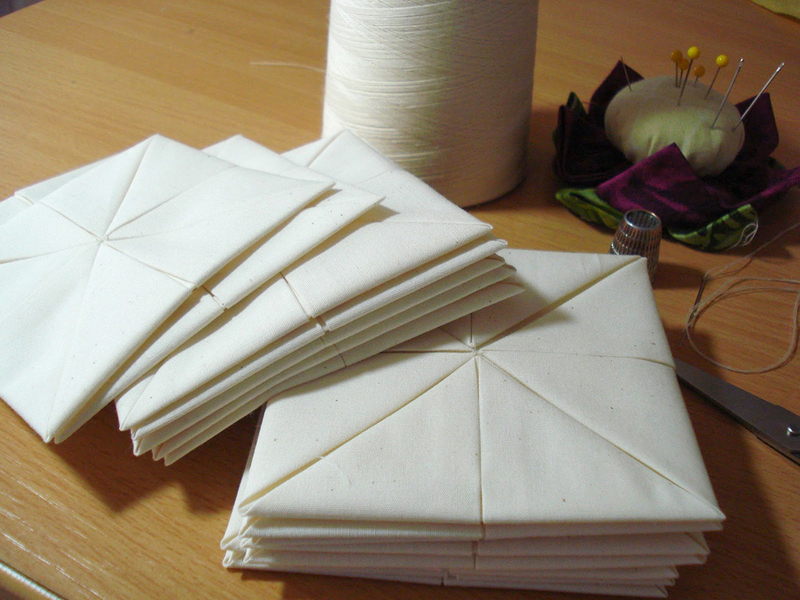 Fold and hem the width of your pillow edge on one side of each piece. With right sides together, pin the top piece first and stitch, then add the second piece. Turn it right side out and add a pillow form. Hope you’ve enjoyed this tutorial! 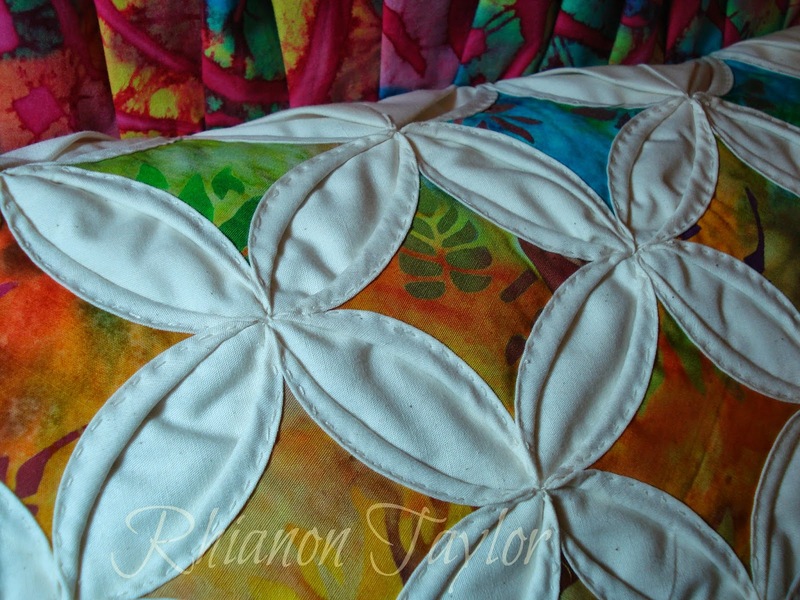 To see more of my quilting and sewing tutorials please visit my blog, The Nifty Stitcher. Krása a nádherná inspirace. Již dlouho mám připravené čtverce, naskládané, ale nedokončené. Po tomto návodu a pěkného postupu tento nádherný polštář dokončím. 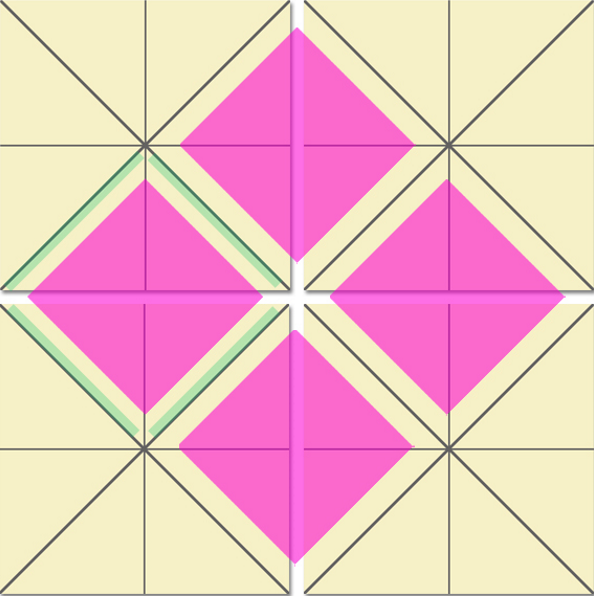 There seems to be a step missing between 10 and 11 : exactly how and where are the batik patches placed, and how do you obtain the rounded white edges? We’re so sorry about that – we’re working on filling in these missing details and will let you know when the project has been updated! Hi there! We have added some additional information to bridge the gap between steps 10 and 11. Please let us know if you need further information! I think the center pieces are placed in there as pictured. You secure them by turning out the triangles ( white ). 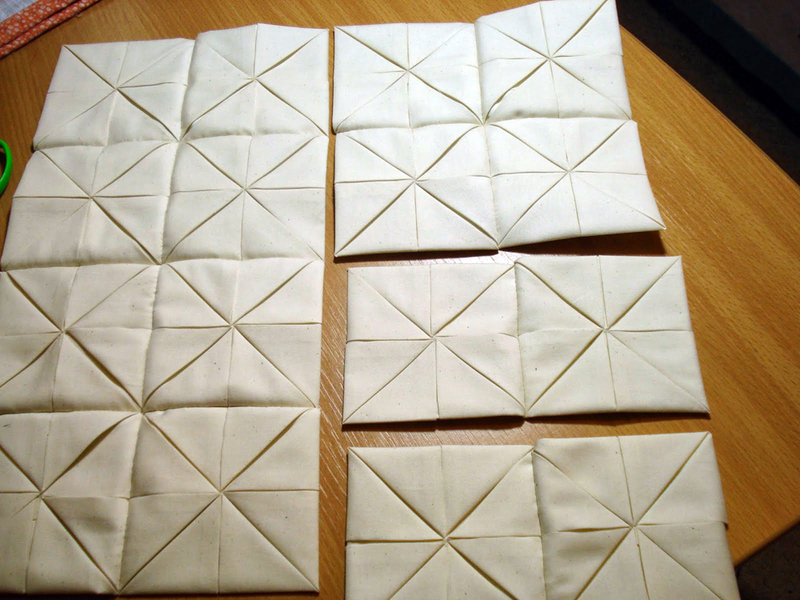 You fold the edges of the white, each of the center thiangles, see pictures. As you turn the white edges stitch them in place. I used appliqué stitches because I don’t like to see the stitches. It’s not really as complicated as you go. When you see it you will know. It’s a good hand project. Hope this helps you. Do I sew all the way through all layers to make windowpane or just the folded material to color pane material only? Thank you for your comment. 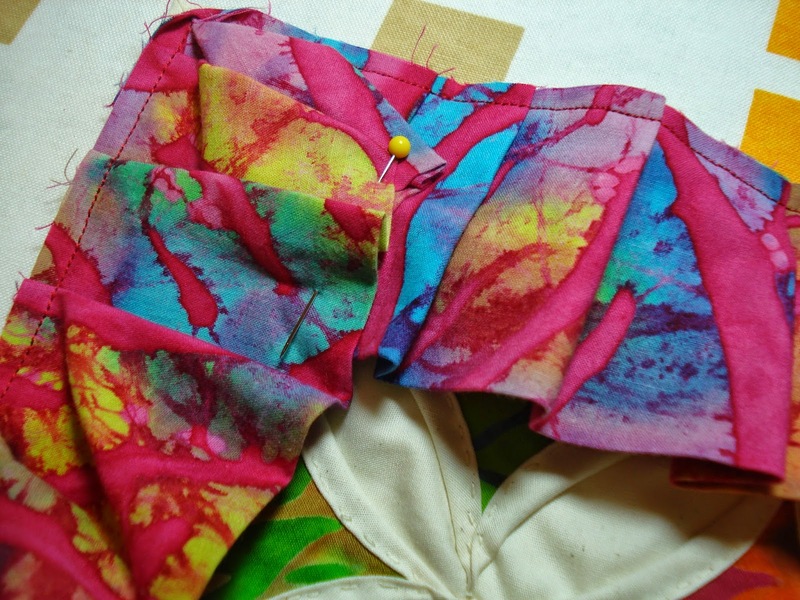 You will want to sew all the way through the fabric. It will hold better. Your instructions and color selection were both excellent. I love this pattern! Love this pattern, so beautiful. Great tutorial. 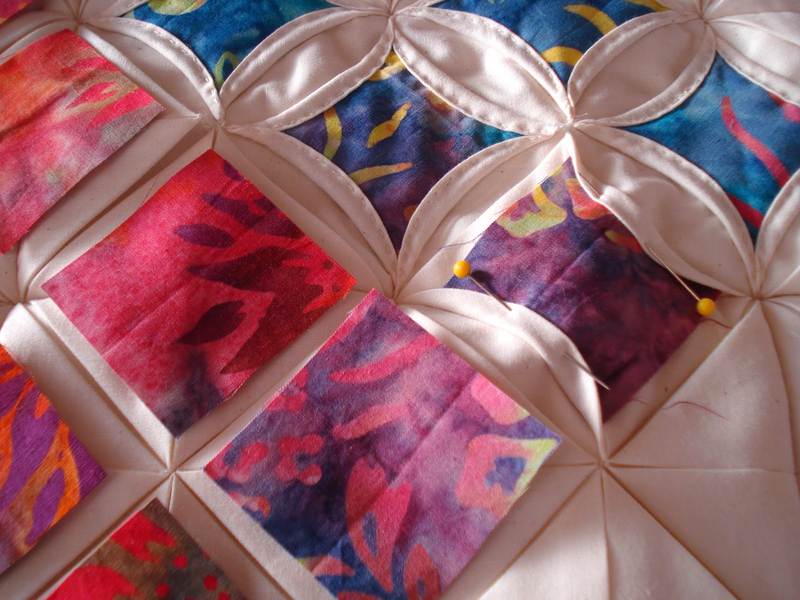 I would like to make this Cathedral Window patchwork pillow. But when I tried to download the instructions to print I got pages of gobble-de-goop and just wasted paper. Are we not able to print out just the directions? If so, How. Hi, Diana. Thank you for your comment. You may print the instructions by right clicking on the page and selecting print via the drop down menu. If you have any further questions, please contact us at 1-855-706-3538. Beautiful, one of my favorite patterns! Sep 9 Is this sewed by machine or by hand. Beautiful and it looks so simple. I can’t wait to try it out. Beautiful pillow! I would never have thought to use the cathedral window pattern for a pillow. What a great idea! It is just beautiful! Thanks for sharing. I see someone else asked the question, but there was no reply. 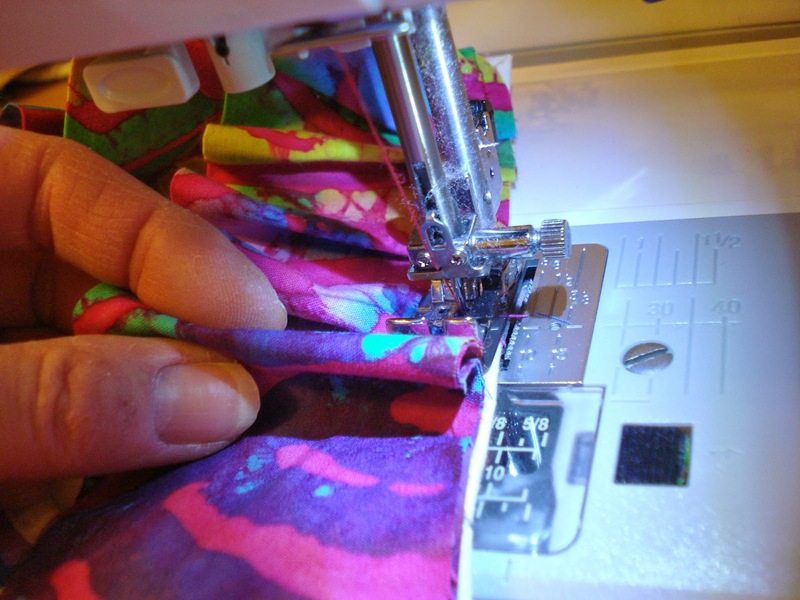 So, can you do all the sewing on the machine rather than doing hand sewing? Hi Margie. Yes, I did it all on the machine. I love this pillow, my question is. The white material is it muslin or can you use broadcloth or other fabric. I would like to make a quilt with this pattern. Hi, Lise. 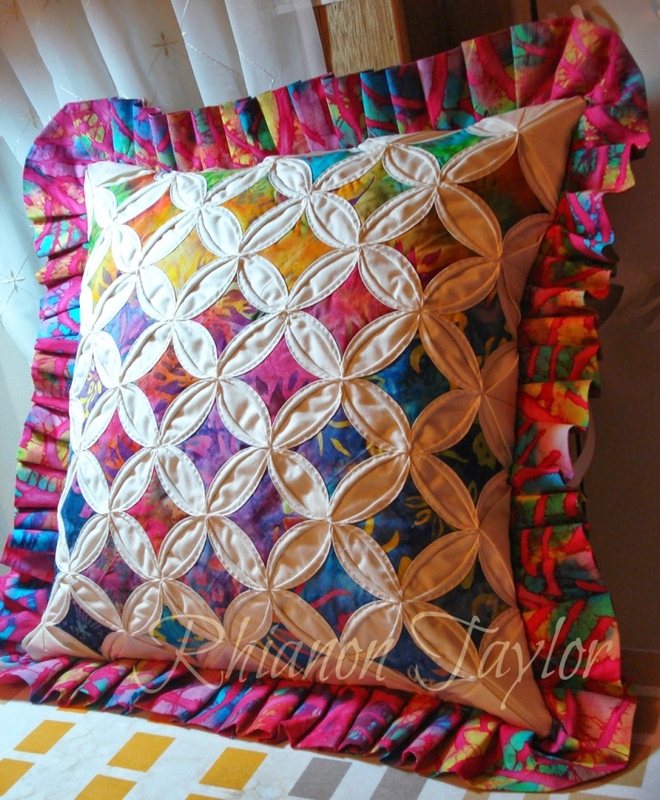 You can use muslin, broadcloth or quilters cotton for the background of this pillow. Hope this helps! This is a really very informative post. I would like to share this technique with my fellow artisans. This actually looks like something I could complete because of its “finish as you go” method. Love Cathedral Windows. Thanks for the pattern. Margaret Anderson. This has been the best tutorial for steps (with pictures) on making the Cathedral window pattern that I have ever reviewed. It makes me want to start right now! !